In this tapestry "Klimt Tree Of Life" we see a contemporary rendition of the sacred and symbolic Tree of Life. The work of Gustav Klimt (1862-1918) an Austrian painter in the Vienna Succession movement, this work bears his hallmarks of beauty and innovation. Klimt created the "Tree of Life" project to decorate the dining room of Stoclet palace in Brussels around 1905. Here we see the swirling patterns in the tree branches which represent the branches of the sacred Tree of Life or tree of knowledge. The spirals and patterns of geometric shapes create a work that is very much his unique signature. The color palette is cohesive with the browns, greens and golds complementing each other and the subject of nature perfectly. Filled with energy from its gorgeous patterns, this work by Klimt represents the Tree of Life in a contemporary way that reflects the subject matter perfectly. 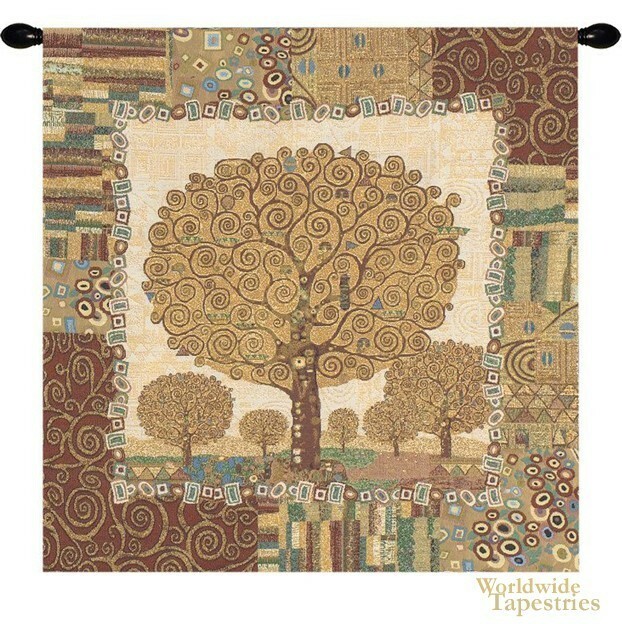 This "Klimt Tree Of Life" tapestry is backed with lining and tunnel for ease of hanging. Dimensions: W 28" x H 28"